Finnish Symphonic Power Metallers AMBERIAN DAWN have teamed up with Metal Shock Finland to premiere their new video for the title track “Magic Forest”, to be released on July 7th 2014 via Napalm Records. Watch it below. With their sixth album, AMBERIAN DAWN take the listener on a journey into the heart of the “Magic Forest”, where enchanted and fantastic creatures dwell with the Finns providing the soundtrack to this unique journey. AMBERIAN DAWN‘s melodic Symphonic Power Metal offers the whole spectrum of fast doublebass hymns, symphonic epics and magical dream-like parts. Capri crowns the sophisticated arrangements with her beautiful voice and enthralls the listener with her stunning vocal lines. “Magic Forest” elevates AMBERIAN DAWN right into the premiere league! Finnish symphonic metal band AMBERIAN DAWN have just announced their signing with Austrian Rock & Metal Powerhouse Napalm Records. The band will be releasing the band’s new album Magic Forest in June 2014. ”I’m very glad about this new deal with Napalm Records. I’m sure that our cooperation will be successful and enjoyable. This label showed interest in us at the very beginning of our career so I feel very comfortable working with this great label today! Together with our booking agency/management Twisted Talent Concerts we’re surely going to make something happen here,” comments songwriter Tuomas Seppälä. “Memories Fall”, the new video from DARK SARAH, the new project led by former AMBERIAN DAWN singer Heidi Parviainen, can be seen below. The track, which features a guest appearance by former XANDRIA frontwoman Manuela Kraller, will appear on DARK SARAH‘s debut album, “Behind The Black Veil”, to be released later in the year. Regarding where the idea for the name of her new project came from, Heidi told SonicCathedral.com: “The name Dark Sarah came along with the first lyrics I wrote for DARK SARAH. “The story is about a woman who has gone through some rough times, and was actually left at the altar by her husband. She almost breaks down but something wakes up inside of her and she changes to another person, her meaner half, Dark Sarah. “I was so in the story of Dark Sarah that it became my project name and it could also be my alter ego too. [laughs] I also liked the fact that the name Dark Sarah sounds like a super villain or a cartoon figure (like Cat Woman , Jekyll & Hyde etc. ), and they all have their metamorphosis too. Parviainen left AMBERIAN DAWN in November 2012. Her final appearance with the band was at the Metal Female Voices Fest at the end of October 2012 in Belgium. She has since been replaced by Päivi “Capri” Virkkunen. Parviainen sang on AMBERIAN DAWN‘s first four albums — “Circus Black” (2012), “End Of Eden” (2010), “The Clouds Of Northland Thunder” (2009) and “River Of Tuoni” (2008). Former AMBERIAN DAWN vocalist Heidi Parviainen has posted a teaser for her new project, entitled DARK SARAH. The clip below features a sample of the track ‘Save Me’. “Cold Kiss”, the new video from Finnish female-fronted symphonic metallers AMBERIAN DAWN, can be seen below. The track, which features a guest appearance by STRATOVARIUS singer Timo Kotipelto, comes off AMBERIAN DAWN‘s fourth studio album, “Circus Black”, which was released in Finland on February 29 via Spinefarm Records. The band’s mainman, keyboardist and guitarist Tuomas Seppälä composed all ten songs for the CD and vocalist Heidi Parviainen penned the lyrics. “Circus Black” features additional guest appearances by Tuomas Nieminen (ex- ADAMANTRA, THRONE OF CHAOS), Nils Nordling (ex-DREAMTALE, ANIMAL HOUSE) and Jens Johansson (STRATOVARIUS, DIO, YNGWIE MALMSTEEN’S RISING FORCE). Nieminen and Nordling share vocal parts in the song “I Share With You This Dream”, Kotipelto sings lead on “Cold Kiss” and Johansson plays a keyboard solo on “Crimson Flower”. 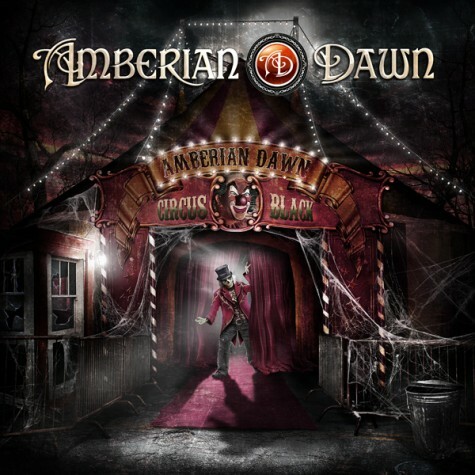 Commented Tuomas: “‘Circus Black’ is the most impressive AMBERIAN DAWN album so far. Musically it represents the most sophisticated and most symphonic edge of AMBERIAN DAWN music. There’s more diversity on this album than never before. This is the first time we used a real choir and we gathered some really excellent professional opera singers together to be able to achieve the best-sounding choir possible. This choir was conducted by Mikko P. Mustonen from Pathos Music. He also arranged the choir and orchestral parts. “We managed once again to get some world-class guests on this album. So, the production is our biggest so far and the final polish on this album was given by Teropekka Virtanen (mixing engineer) and Mika Jussila (mastering engineer) at legendary Finnvox Studios in Finland. Finnish female-fronted symphonic metallers AMBERIAN DAWN will release their fourth studio album, “Circus Black”, in Finland on February 29 via Spinefarm Records. The band’s mainman, keyboardist and guitarist Tuomas Seppälä composed all ten songs for the CD and vocalist Heidi Parviainen penned the lyrics. “Circus Black” features guest appearances by Tuomas Nieminen (ex- ADAMANTRA, THRONE OF CHAOS), Nils Nordling (ex-DREAMTALE, ANIMAL HOUSE), Timo Kotipelto (STRATOVARIUS) and Jens Johansson (STRATOVARIUS, DIO, YNGWIE MALMSTEEN’S RISING FORCE). Nieminen and Nordling share vocal parts in the song “I Share With You This Dream”, Kotipelto sings lead on “Cold Kiss” and Johansson plays a keyboard solo on “Crimson Flower”.